This allows app developers to make interesting and highly functional apps, and lets the end-consumer pay for only the functions accessed, when they access or use it. Our first apps utilizing the Krosscoin Platform is the patent pending Pipdroid app family. Pipdroid apps lets forex and crypto traders launch and manage trading bots right from their smartphones. Imagine being able to access and launch bots to both forex broker platforms and crypto exchanges, right from your hand held device, anywhere you are!!. Join us as we revolutionize one industry after the other with our amazing applications. Similar to Pipdroid Pearl, it lets traders access Metatrader by launching MQL4 Expert Advisors (EAs or bots). Traders can automate trading of forex, commodities and stocks. Some transactions consume KSS. Both Pipdroid Pearl and Pipdroid Petal are available for download and beta testing on Google Play Store, as proof of the ingenuity of Krosscoin. Pipdroid Optima is the crowning product in the Pipdroid Application Family and will herald a new age of trading globally.This is an innovative, revolutionary cross trading brokerage/exchange platform. Pipdroid Optima allows for forex, stocks and cryptocurrency trading in the same environment. Traders can transact across multiple exchanges simultaneously, conduct rate arbitrage, or simply optimize buying or selling price. An embedded chat platform enables group coordination and knowledge sharing. Optima introduces the idea of “social trading” or “follow the expert,” where profitable portfolios can be copied, and owners of these profitable portfolios can earn KSS from their subscribers. 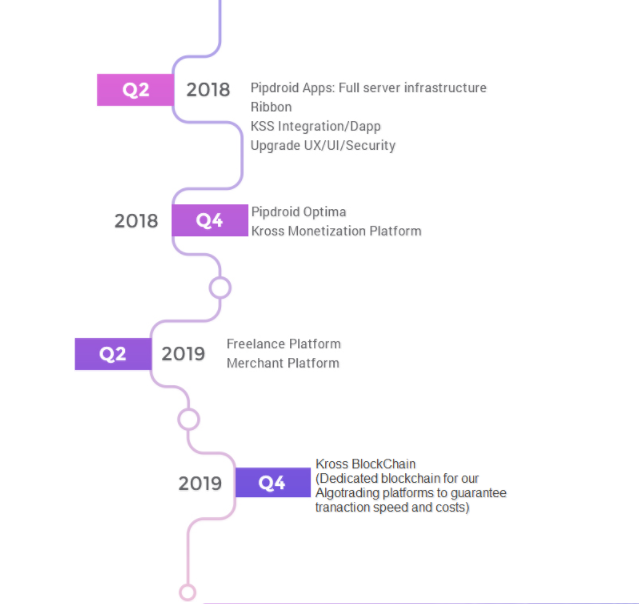 Pipdroid Optima is already being developed, and currently two out of the following crypto exchanges have been integrated into a Forex platform to enable detailed analysis and for bots to be launched seamlessly to forex platforms and crypto exchanges in the same mobile application. Ribbon converges text/voice/video communication with gifting using a cryptocurrency wallet. Ribbon enhances vital communications among teams, groups and family. Charity and non-profit organizations can utilize Ribbon for anonymous fundraising. Embedded GPS navigation allows for in-person meet-ups for social or cash to crypto transactions. Social network integration can publish “ribbons” to inspire others to contribute. Ribbon can also send signed pdf/word documents and is embedded with Google Translate. Exchanges whose APIs we are working with are ; GDAX, Bitstamp, Kraken, BTC-e, CEX.IO, Gemini, Quoine, Qryptos, bitFlyer, OKCoin, BitVC, Bitfinex, BTC China, BitMEX, Huobi, Luno, Poloniex, Bitsquare, Bithumb, Bittrex, QuadrigaCX, Binance. Currently Binance and Bitfinex has been integrated and tested.